Comic artists have it easy - they can scan their pencil drawings and then edit them. But how to make a realistically looking pencil drawing from a photo? In this tutorial you will learn how to convert almost any image into a good-looking pencil drawing, and yon even won't need edge detection filters. All you need are a few different layer modes. Open any photo you like. If you want to do the tutorial exactly as shown here, feel free to use the photo of Angelina Jolie (download link on the right side below the tutorial details). Duplicate this color-less layer again. Now you have 3 layers. Now choose Filters / Blur / Selective Gaussian Blur, value: 4. Then use Colors / Invert. Then change the opacity of the layer to 50% to get a grey layer that shows the photo’s edges very weak. Merge the layer with the layer down: right-click the layer in the Layers window and choose “Merge down”. Duplicate the now merged layer and change the new layer’s mode to “Dodge”. Now the pencil drawing is finished! Merge the two grey layers so that you can find the line drawing on a single layer. Duplicate the layer again and change its mode to “Multiply”. Repeat this step as often as you like (until the width of the lines is OK). On my image I have applied a layer mask over the line drawing so there is a transition between photo and line drawing. (To do so duplicate the original photo and move this layer to the top of your layer stack. Then right click this layer in the layers dialogue and click “Add layer mask”. There should be a white are beside the layer. Click it to make sure you work on the layer mask. On this you can paint (i.e. using the Paintbrush tool) with black and gray tones to make some parts of the layer contents disappear (paint black = make disappear, paint white = show, paint gray = make semi transparent). So you can make a cool transition between your pencil drawing and the original photo). This topic (Making a pencil drawing from a photo) has been rated 4.3/5.0. Did this on the Angelina file and it worked first time. The second time I could not get the opacity to come out right .. I see a transparency layer underneath. Here's a better way to make a pencil drawing from a photo. Download the G'MIC plugin for the GIMP. Go to Filters -> G'MIC. In the list of filters, open up the "Black & White" section. In there, click on "Pencil portrait". Click OK. Wait a while as this can be CPU intensive, but the results are worth it. I've attached an image with the default parameters. By the way, I shouldn't have been so harsh in my previous post. This article isn't "useless"; it actually does a good job of demonstrating how Difference of Gaussians edge detection works. This tutorial is useless as the exact functionality (making a copy, blurring it, subtracting) is already builtin to the GIMP: Filters -> Edge-Detection -> Difference of Gaussians. If you set the smoothing radii in the dialog box that comes up to 4 and 0, you get exactly the same effect. I'm attaching a picture so you can see. The article mentions that the technique works "without edge detection", which makes me think that the author accidentally reinvented DoG edge detection not knowing that it was a standard function. Kudos to them, and it's kind of neat to see it done by hand, but it's not necessary. Then I tried Free Select Tool and added 2 black layers. I change the opacity of the layers. Select / Feather, value: 30, Edit / Clear created the blur area. I appreciate this style of doing line drawing. I however haven't understood step 7. If someone can clarify I will be glad. Yes,this is good,it would be a bit better if the screens displayed were in English! This is the best technique I,ve seen so far for making line drawings. i had almost finished it.. I wanted to make a pencil draw effect.. this tutorial was nice.. And by viewing this article, i went to do that exactly with the same pic.. But, as i am new to GIMP, i cant get the last part.. "On my image I have applied a layer mask over the line drawing so there is a transition between photo and line drawing." Can anyone brief with steps how that effect can be achieved??? 1- you get the drawing on an alpha channel allowing you to put any background you want. Nice tutorial. Just to clarify the STEP 2. after duplicating the layer, you have choose the duplicated layer "Background copy" in the layers dialag. If you don't see the Layers dialog, then click ctrl-L to see the dialog; then highlight the "Background copy". To apply the desaturation, you have to use Colors->Hue-saturation dialog. Not colors->colorize. Colors->Colorize does not show the dialog as you see in the step 2 picture. Worked great! The first layer barely showed up, but when I added a few multiply layers, it came out really nice. Great tutorial! Thanks! Short and simple with tremendous results. That was really good. My lines turned out too light, so I increased the contrast. It turned out sort of grainy, though. in the layers dialogue right click on the layer that has the line drawing: "Add layer mask" (select white in the popup dialog). there will now be a new layer right beside the layer now in the layers dialogue. it will be fully white. click it to activate it. this is the so called mask -> you can only draw black and white and gray tones. then take the gradient tool, set FG and BG color to black and white and drag a gradient from (i.e.) left to right. then the part that is black on the layer mask becomes (semi)transparent. "On my image I have applied a layer mask over the line drawing so there is a transition between photo and line drawing." How did you do that? Could you explain that part step by step? The end result with the half pencil image is pretty cool. how to change image to pencil drawing in photoshop7? I am an absolute beginner but desperately need to be able to do this exact thing for an important project. I've downloaded the progam and followed each step, but each time I try, at Step 4 it all goes to pot. How do I set value 4 to the selective gaussian blur? I've tried dozens of times - I can even get all the way to setting the duplicated merged layer to 'dodge' but what I end up with looks nothing like a pencil drawing! It's getting close to 'banging head on the desk' time so can someone PLEASE tell me what I'm doing wrong? Great! Awesome! Thanks for the tutorial. I never guess that effect will be as easy like that :D thanks for sharing. I like What Ive learned so far and I have Archived a lot by using gimp please notify me when new things are out on gimp THANXX! Very nice tutorial. I'm using Gimp 2.6.3 and there's some minor differences in the dialogs, e.g. in the "Selective Gaussian Blur" there 2 parameters "Blur radius" and "Max Delta". I made some experimentation to find a good result. No comment. Just thanks for the great tutorial. My image turned our very good. But can someone tell how to keep half of it in colour ?? I have the same problem as blackrain. Though I have experienced that following your steps sometimes results in something different (XD) and I have to alter the steps sometimes - but in the end, it would always work. By the way, blackrain option two you will find under hue something, but not colorize in 2.6. Excellent tutorial - thanks! And thanks to devv for pointing out where to find "dodge" - sich things not always obvious to the newbie!! the toolbar that has the copies on it it doesnt show up! why? how to do you change the opacity to 50%? Thank you, that was exactly that i searched ! Hi, good tutorial, congratulations. I've experimented a bit and increased yellow in color balance, previous to desaturate(don't know if makes difference), and substituted selective gaussian blur by "focus blur" value of 8. The results are pretty good and the lines are more thick. Can this proccess be automated as a script fu? Hi. 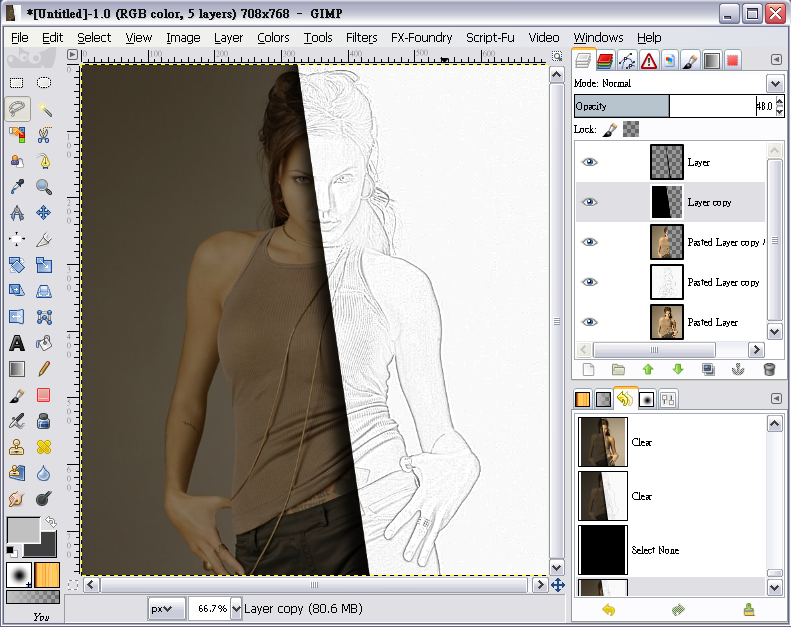 Have get the plugin pencil-drow..for gimp.How do i install it i the program? Have you tried edge detection, I think it works a bit cleaner and the traces are better. in the layers dialog look above the opacity/transparency ruler. there is a dropdown called "mode"
how so you change the layers mode..i dont know how to do that..
take a picture of yourself. use a bright / white background and apply the steps shown in the tutorial! how do i make this for my self? Cool effect. :) Would you be able to make a tutorial on blending two images together?